The Corn Maze is fun for the whole family! Learn more about one of our most popular activities. Find out how your child can join the hundreds of children having fun each summer day at Beachmont Christian Camp! Learn about the new 8-week program, beginning in spring, to teach students the basic skills of football. Our 8-week program has now been broken into 3 different classes, providing a challenge for students of all skill levels. 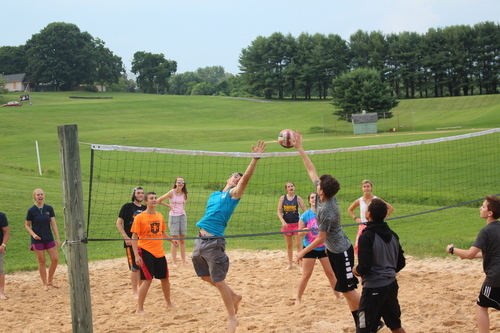 The best dodgeball games in Kingsville, Maryland happen at Beachmont. Find out how you can play. The annual Beachmont Golf Tournament is much more than 18 holes of golf at one of Maryland's golf courses. This is a once a week program designed to expose students who are educated at home to a variety of skills through activities, sports, and fitness exercises. Join us Easter morning at 6:30 a.m. to celebrate the rising of the Son! Gather your family and bring them to Beachmont on Friday evenings for food, fellowship, fun and a family flick. Want your child to learn how to swim? Beachmont water swimming instructors can help. Each Tuesday night during the summer, teens gather for fun, games, fellowship and worship on Teen Night.